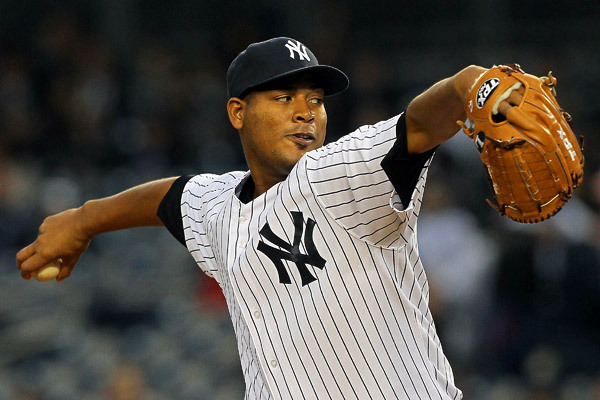 Since being placed back in the starting rotation, Ivan Nova has made four straight quality starts. Over that span he has lowered his era from 5.16 to 3.63 and has quickly made himself someone Girardi can hand the ball to every fifth day. His last two starts weren’t just quality, they were great. Nova threw a complete game against the Orioles last week, allowing just two runs on three hits with 11 strikeouts. Last night, he followed that up by going eight innings surrounding just one run with 6 strikeouts against the Royals. Nova has combined for 17 strikeouts in his last 17 innings pitched, which is excellent. Pitching has been the least of the Yankees problems this season. Overall the staff has thrown quite well, the offense is what has been letting this team down. If the bats do ever wake up for an extended period of time, the Yankees will rise right back up the standings if they can continue to pitch at this rate. The recent success Nova is having is a great sign for the Yankees future. With CC Sabathia, Hiroki Kuroda and Andy Pettitte all either in the back end or end of their careers, it is important to have an influx of youth in the rotation. The Yankees will look to have the 26-year-old Nova and 24-year-old Michael Pineda, when he returns to full health, as starters they can count on for years to come.